Most real estate transactions involving a re-sale property, as opposed to a new home, involve a wood-destroying insect or termite inspection, or more commonly referred to as a “Termite Letter” which many lending institutions require. Most new homes are required to be treated with pesticides during the construction process and should not be susceptible to immediate insect damage. Even if a Termite Letter is not required in your situation, you may choose to have this service provided as additional assurance or information. Some conditions relevant to potential insect damage, may not, by licensing board requirements, be included in a home inspection report. You would need both a home inspection and a termite inspection to receive a more complete assessment of the property. Who Can Provide a Termite Inspection? Any person must be licensed by the Structural Pest Control Division of the North Carolina Department of Agriculture and Consumer Services in order to issue a Wood Destroying Insect Report (WDIR-100) or by a reciprocal agreement with the state of South Carolina Department of Fertilizer and Pesticide Control, Regulatory and Public Service Programs to issue a CL-100 report. All of our inspectors are licensed Registered Technicians and are accredited members of the North Carolina Pest Control Association. Is a Termite Inspection Included With a Termite Inspection? 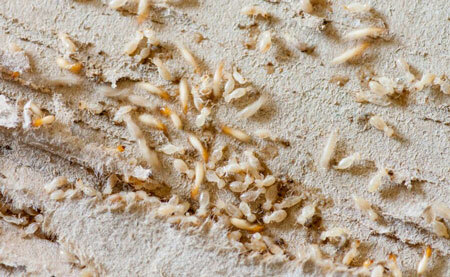 A wood-destroying insect inspection and report “Termite Letter” may be included with your home inspection. Typically a home inspector will spend more time inspecting a home than a person who is only conducting a pest inspection. For this reason, having Colony Home Inspections’ home inspector handle the pest inspection while conducting the home inspection may provide a more comprehensive examination of the home. The WDIR-100 (NC) or CL-100 (SC) report forms will be included in the home inspection report as an attachment, easily printed or forwarded to the appropriate parties. Pest inspection services are provided under license agreements with Termitech-South, Inc.
Pest control and treatment services are also available. Please contact Colony Home Inspections’ home inspectors for more information. Our registered technicians will be in the home for hours doing the home inspection; let us do the best pest inspection available while we are there! No need to schedule separate appointments!